A commercial airliner arrives at its destination with every passenger and crewmember on board dead. The FBI investigate. Clues suggest that the only person who can help with the investigation is a brilliant but disturbed scientist named Walter Bishop. Bishop has been locked up in a mental institution for seventeen years and the only person who can sign for his release is his son, Peter, a shady businessmen. FBI Agent Olivia Dunham and the Bishops successfully discover the answer to the mystery, encouraging the FBI to create a special unit dedicated to these 'fringe science' cases, which have exploded in frequency in the last few years. The cases are varied and individual, but together form 'the Pattern', a statistical trend that suggests a major event is coming. It's easy to dismiss Fringe because of misconceptions. A new TV show from the creator of Lost, J.J. Abrams? And a premise that seems to owe rather a lot to The X-Files? The number of people who passed the show by, fearing (fairly or not) muddled mythologies and an inferior homage to an older show, must have been significant. However, such reactions would also be unfair. Fringe distanced itself almost immediately from Lost by having a much smaller cast of characters, meaning a much tighter focus on the stories and the gradually-evolving backstory. Abrams also took a back seat after the pilot, letting other writers and producers come on board to direct the day-to-day running of the show. A key difference is that whilst Lost's mythology only got some direction in its third season, when an end date for the show was set, Fringe's mythology and story arcs were mapped out in advance from early in the first, giving the show a much stronger sense of direction. The season kicks off with the pilot, in which the regular cast and premise is established. Anna Torv immediately impresses as Olivia Dunham, a no-nonsense FBI agent (though prone to unexpected bouts of deadpan humour) who has a lot of pressure riding on her shoulders. Joshua Jackson takes a little longer to convince as a businessman with shady contacts, but eventually turns in a very human and funny performance. The main weapon in the show's arsenal is the spectacular John Noble - previously best-known as Denethor on the Lord of the Rings movies - who plays Walter Bishop to perfection. Character traits and tics that would have been hokey or hammy in another actor's hands become utterly convincing in Noble's, who is able to play his character's memory problems and occasional emotional outbursts for either comedy or pathos as the script demands (occasionally both simultaneously). It's frankly worth watching the show just for Noble's performance. Also providing able support is The Wire's Lance Reddick as Dunham and company's boss, Philip Broyles. The show's premise - that the FBI would employ a certified lunatic, an occasional criminal and a cow called Gene to investigate fringe science cases from a basement in Harvard University - takes a bit of swallowing. The show does its best in the pilot to try to make the premise a bit more palatable, but it's surprisingly late in the episode before 'the Pattern' and the great urgency to find out what the hell's going on (making it a bit easier to accept the desperate lengths the FBI are going to) is more firmly established. That out of the way, the show quickly establishes a format: the mystery-of-the-week is laid out in the pre-credits sequence and our heroes rapidly show up to investigate, usually involving labwork from Walter and good old FBI fieldwork from Olivia. The procedural aspect of the show was apparently key to getting it on the air - the producers deliberately used it to entice Fox on board - but it's not too many episodes before it's being downplayed in favour of the crazy lab antics. These episodes also hit that early X-Files sweet spot of having (mostly) satisfying, self-contained stories with more serialised elements being laid down in the background. It's not too long before Fringe's serialisation and mythology comes to the fore later in the season. A recurring enemy is established early on, followed by another, more dangerous one later on. Walter's memory loss, initially established for comedic purposes, later becomes far more important as Walter begins to discover the ramifications of experiments he conducted twenty years earlier. A key episode reveals that Olivia herself may be part of 'the Pattern' and the discovery of a manifesto belonging to a terrorist organisation spurs events in the series finale. Watching over events is a strange bald man in a suit and hat, who appears (if only fleetingly, or in the extreme background of some scenes) in every single episode and is more strongly featured in two of them. An off-the-cuff reference to quantum theory in one episode sets up a major storyline that emerges in the finale and provides the season with its final and most famous cliffhanger image. This segueing from the stand-alone elements to the more-heavily serialised storylines is well-handled, though some may lament the decreasing frequency of the stand-alone mysteries in the late season. At its best Fringe is a surprisingly gory homage to The Twilight Zone, but at its worst can be trite and predictable (though allegedly the worst episode of the season was actually cut, showing pleasingly surprising creative integrity). Fortunately it's worst is very rarely encountered. Slightly more problematic - though perhaps unavoidable in these kind of shows - is the number of times that major reversals and deaths could have been avoided if the characters just stopped and talked to one another properly for a few minutes. Whilst far less of a problem than on Lost, it still niggles when Walter says something cryptically vital, Peter notices but then gets interrupted by Olivia and doesn't bother to raise the question again at the end of the scene. Overall, the problems are few and outweighed by the positives. Season 1 of Fringe (****½) starts off as a finely entertaining slice of SF hokum before being carried by excellent performances and a reasonably compelling central storyline into a finale that leaves one eager to move immediately onto the second season. The season is available now in the UK (DVD, Blu-Ray) and USA (DVD, Blu-Ray). Joshua Jackson has been very outspoken about Noble's performance saying basically, that it is a crime Noble hasn't --at the least-- been nominated for an Emmy. Hard to argue that point because if there's ever been a better portrayal of the Mad Scientist on television, I'd love for somebody to point it out to me. "Joshua Jackson takes a little longer to convince as a businessman with shady contacts, but eventually turns in a very human and funny performance." Couldn't agree more on this point, Adam. Initially, Jackson annoyed me so much I swore of the show. I gave it another try and have come to realize his character arc from that initial annoying know-it-all is turning out quite well, at least through season 2. There are some VERY effective scenes between Jackson and Noble throughout the show. Major fan of Fringe here. It's one of the few TV shows that actually made me pay attention to the ongoing underlying plots. Sure, there were the usual "monster/mad experiment-of-the-week" but they still often found ways to tie into the overarching mythos, providing a slow, but satisfying buildup. The next seasons are: excellent, then interesting, then cool sci fi, then proper ending. Overall, amazing TV and Noble just got better and better. 100 hours of entertainment. Four-and-half stars? The first season of Fringe is much weaker than the following ones. 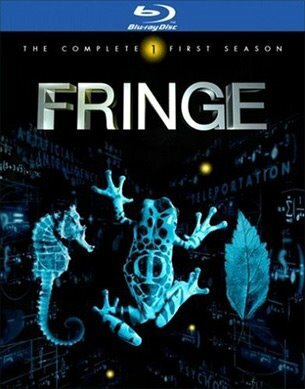 Fringe is such a fantastic show, and from the beginning it becomes clear that it's a show about the present attempting to come to terms with the past, even while the future looms so ominously over everything. The relationship between the Bishops becomes increasingly crucial. It's Olivia, of course, who remains at the heart of the experience, someone who never quite understands her role but is game to play along. She demonstrates great compassion for Walter, even when Peter is incapable, and even when she herself discovers reason enough to hate him. It's because she's got a scary past, too, but has managed to move on from it. Anyway, the stranger things become the more rewarding the whole series is. If you're just now watching it for the first time, keep that in mind. Not having watched the following seasons, I couldn't judge S1 against them, so had to score it on its own merit. If the following seasons are better, it's going to be the full red five all around. I have only watched seasons one and two. On the one hand I didn't like season two as much as season one, mainly because the (predictable as far as I was concerned) finale of S1 left me with a desire to know more about the ongoing backstory and in consequence felt impatient with the self contained episodes. On the other hand, with a show like this one, I decided to bide my time and wait for it to end/be cancelled. I will probably go back to it sometime but season two was kind of a let down for me. Season 1 - Not bad, seasons 2 & 3 - Excellent, season 4 - Not bad... Looking forward to the 5th & final season! Yeah, the first season felt to me like a somewhat half-assed (though very well-produced) ripoff of the X-Files with some interesting little quirks and an awesome performance by John Noble. A lot of Abrams' tics were on display (a complete disinterest in how science works, a lot of superfical "HEY LOOK GEEKS THIS IS COOL" stuff that doesn't really go anywhere) and the story-of-the-week tended to feel like weak tea compared to the X-Files; most of them are bare-bones simple gore-delivery systems. The second season took a notable step up in quality at about the halfway mark, when the mytharc really started rolling. I also thought Torv was a little stiff in S1 (probably due to having to conceal her accent), something that even the show seemed to be commenting on, but she really grew into the role. I thought the show ended well - I feared it would be as disappointing as the conclusions of Lost and BSG). Although I wasn't totally on board with the way Season 5 started - it took 3-4 episodes for the plot to get going.